The PDF format is used frequently by academic institutions and businesses. This file type works well in many aspects, except for the fact that it can be hard to edit without the right tools. Perhaps you want to add content to or delete text from a PDF file? Not all document applications on your Mac will allow you to modify text on your PDF this way. 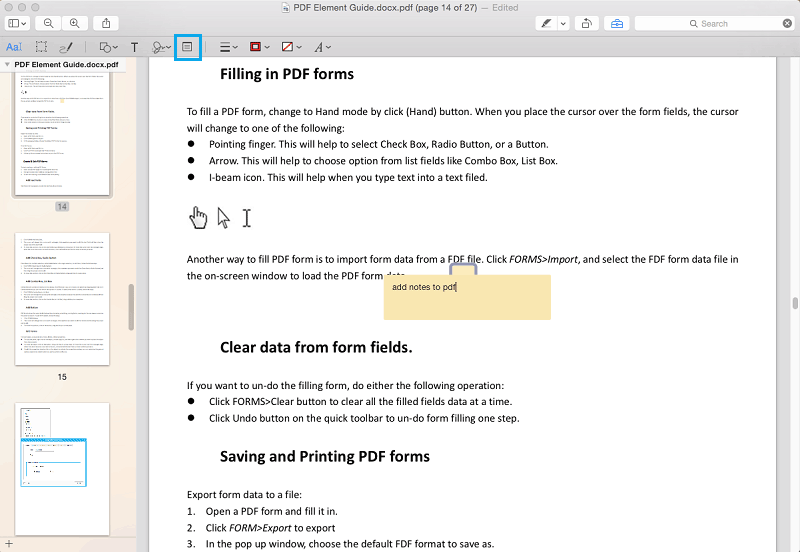 So you may be wondering how to edit PDF text on Mac? The solution is - PDFelement for Mac. PDFelement for Mac is compatible with macOS X 10.14 (Mojave), 10.13 (High Sierra), 10.12 (Sierra), 10.11 (El Capitan) and 10.10 (Yosemite). Download and install this application to get started. Once you have downloaded and installed PDFelement on your Mac, launch it to add files to the program. 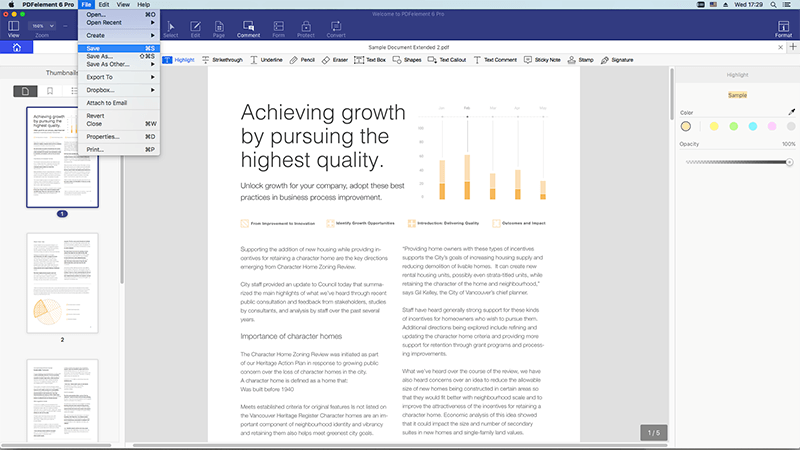 Just click on the "Edit PDF" button, indicated under the blue area. The PDF file will be opened in the program. Alternatively, you can add files to the program by clicking on the "Open File" button on the "Home" tab. The program will then direct you to the finder where you will have to search and open the PDF file you need. In the top tool bar, click the "Edit" button to enable editing mode. You can then click the text block to modify, insert or delete text. To easily and smoothly edit text, you can also choose between "Paragraph Mode" and "Line Mode". These allow you to edit text in a line or paragraph bounding box. To add a new text block, you can click on "Edit > Add Text". Use your mouse to draw a text block anywhere on your document and then start typing inside the text box. To remove unwanted text, select the text and press the "Delete" key. To apply the changes permanently, you need to save your work. Go to "File" and click on the "Save" option to save the changes. 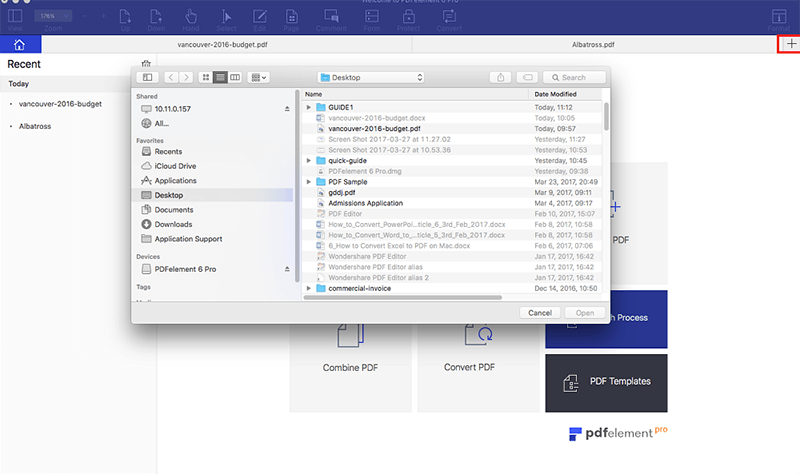 PDFelement for Mac is an all-in-one PDF solution, which can also help you convert PDF to Excel, Word, EPUB, PPT, Pages, HTML, RTF, text, images and more. You can create industry-standard PDFs from various source files and can add passwords to protect PDFs from being viewed, copied, edited and printed. You can also hide sensitive content with redaction tools. Edit, add, and delete text as smoothly as you would in Microsoft Word. New content, text and lines will automatically match with original styles. Make any change to your document without messing up the original document formatting. In addition to text, images and pages can also be edited easily. Directly edit image-based or scanned PDFs with advanced multi-lingual OCR features. 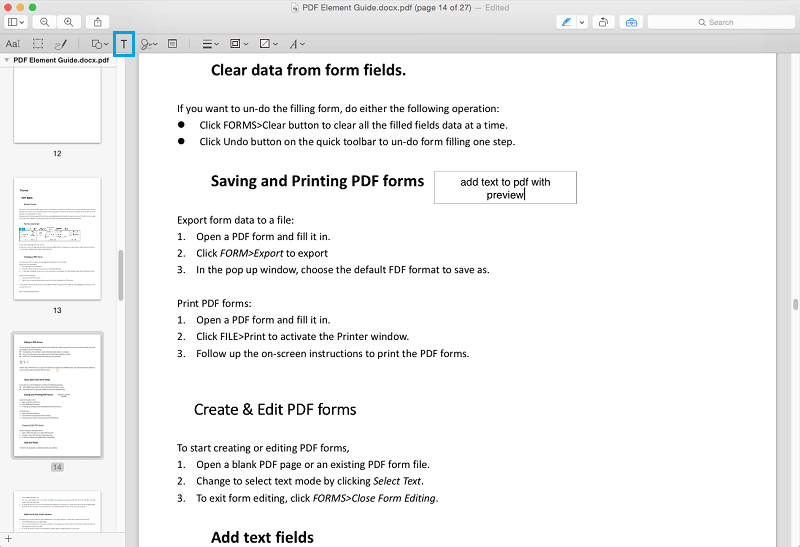 Preview is another solution that allows you to edit PDF text on Mac. Here we'll also show you how to make changes to text on PDF using Preview. Open PDF files in Preview, and then click on the "T" icon on the menu tab. After a new text box appears in the PDF, you can start typing in the box to add PDF text to your file. You can also go to "Tools" and click on "Text Selection". There you can select the text of the PDF and right click to copy. 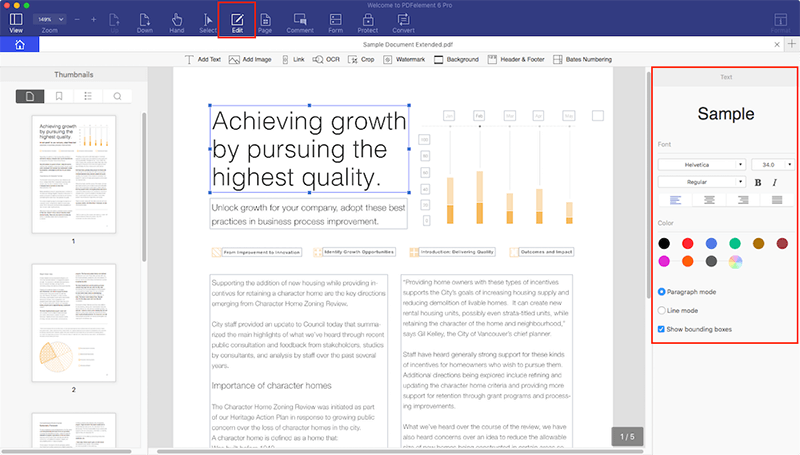 After editing PDF text, you can also insert annotations to PDF file for your own use. Click the "Note" icon on the menu bar. Then click on the location within the PDF where a note must appear. Here you can insert comments in the text box for annotation. You can also drag your mouse to create the required annotation. Shapes and signatures are also available on Preview. Click on "Tools" and then select "Annotate". You'll see all of the annotation tools on the menu. Choose the one you require to put in the PDF document.